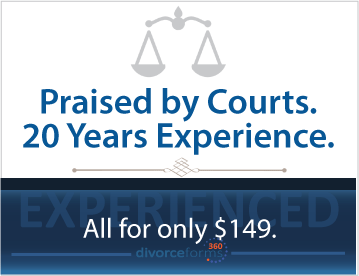 Professionally prepared divorce for only $149.00. We never sell automated divorce forms. Each divorce form is prepared by a divorce specialist. Save thousands over an attorney. THE NATIONS PREMIER DIVORCE SITE. It's true!. You can get professionally prepared divorce forms sent to you ready to sign and file with the court. Our support staff will stay with you and guide you through the entire process. We take the stress, worries and cost out of filing for divorce. WE CARE ABOUT GETTING YOUR DIVORCE DONE RIGHT. Highest quality divorce forms available. When you sign up for our online divorce service, our professional divorce team will review your information and personally prepare your divorce forms, carefully including all the provisions you need for your divorce. This can include division of property, child custody provisions, or a name change. We make sure that your divorce papers are ready for filing with your local county court. That is why we will never use an automated system! 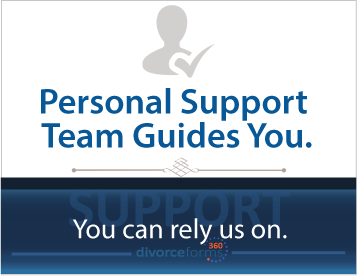 We believe in providing the best divorce service available. Our divorce specialists have years of experience preparing divorce forms. Your divorce forms will be professionally prepared by a divorce professional, ready to sign and file with the court. 100% court approved and up-to-date divorce forms. Professionally prepared divorce forms, specific to your State. Support staff that helps you through the entire process. A divorce specialist will prepare your divorce forms and send them through a final review process to be sent out. No automated systems - Just true professionals. Question: Will I really be able to complete my own divorce. I don't want to waste my time and money. Answer: Yes, you can file and complete your own divorce without an attorney. Thousands of people file their own divorce every week. You can too. Question: Are you different than the other divorce sites. Answer: Yes, and this is important. We have been doing this since the mid-90's, and we still do it the only way we believe is proper. To have a divorce professional hand prepare your divorce forms for you. Answer: Your divorce documents are usually ready in a few hours, although we ask that you give us 24 hours. Then you can sign and file with the court.